For healthcare organizations slow to break through, the fate of Blockbuster Video could await them. ORLANDO -- Innovation can be difficult in healthcare, but it’s more important than ever, said Rebecca Kaul, chief innovation officer at the Houston-based MD Anderson. 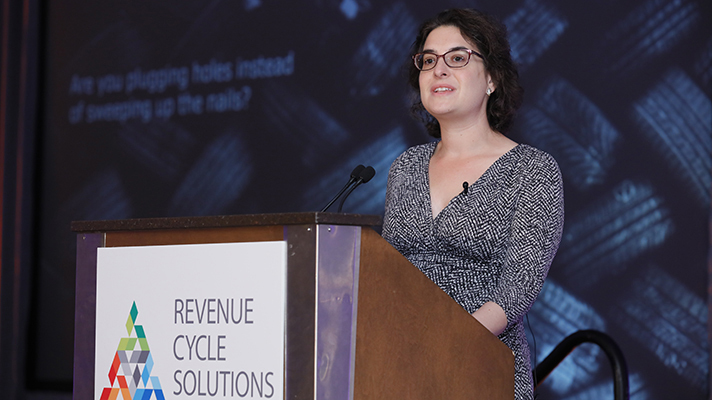 “We’ve all seen what happens when companies get too complacent in their success,” said Kaul during her keynote address at Sunday’s Revenue Cycle Solutions Summit at the HIMSS17 conference in Orlando. Remember Blockbuster Video? Remember when everybody had a Blackberry? While healthcare has seen its share of breakthroughs, much of the innovation relates to developing new drugs, therapies and medical devices. Moonshots are indeed common but often tied to clinical developments. On the other hand, sparse attention is being paid to care delivery, organizational design and new services. But that needs to change, said Kaul, because the risk of failing to innovate is too great. That means healthcare organizations need to rise above the challenges and make innovation a priority. Lack of time, lack of people and lack of budget often get the blame when organizations try to reason their inability to innovate. But, according to Kaul, each of those can be turned into advantages. For starters, not having enough time can create a sense of urgency. Deadlines drive emphasis, and innovation should work under deadline, she said. “Jeff Bezos, the Amazon CEO, has a rule that if a team can’t be fed with two pizzas, then it’s too big. That equates to about six to seven people,” she said. Kaul said her own team hovers between four and five people. A small, agile team has the freedom to get things done, she said, pointing to the many smaller tech start-ups that outmaneuver larger companies before being eventually bought and integrated into the platforms of the big guys. A small team can also help innovation projects that require only small budgets, said Kaul, who before joining MD Anderson said she ran a much larger team as chief innovation officer and president of the University of Pittsburgh Medical Center’s Technology Development Center. But a dedicated innovation team isn’t enough if there isn’t an appetite for change at the highest levels of the organization. The executive teams must be open to abandoning existing business models and reworking outdated strategies.